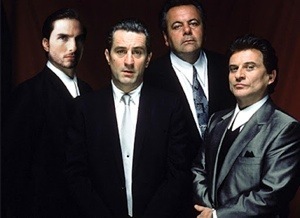 1: In “Goodfellas“, Tom Cruise and Madonna were the producers’ first choice for the roles of Henry Hill and his wife Karen. Ray Liotta and Lorraine Bracco were subsequently cast in those parts. Al Pacino was also offered the role of Jimmy Conway but he refused with the concern of being typecast. Robert DeNiro took over the role and it’s a decision that Pacino now admittedly regrets. 2: As the shoot of “Jaws” ballooned from 55 days to 159, with the budget likewise spiraling, the film earned the nickname amongst the crew as “Flaws“. 3: For “The Thin Red Line“, Billy Bob Thornton recorded a narration under the supervision of director Terrence Malick. However, the final print of the film has voice-overs by eight of the main characters in the film; none of the narration from Thornton is in the final print. In addition, several other stars who filmed scenes were left on the cutting-room floor, including Bill Pullman, Gary Oldman, Lukas Haas, Viggo Mortensen, Martin Sheen and Mickey Rourke. 4: John Travolta’s role of Vincent Vega in “Pulp Fiction” was written for Michael Madsen but due to scheduling conflicts Madsen couldn’t do it. He did, however, play Vic Vega, in “Reservoir Dogs“. 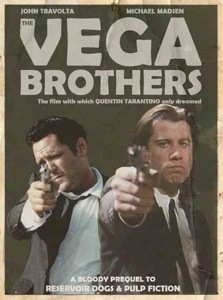 The characters are brothers and at one point Tarantino considered making a film about the Vega brothers with the intended title “Double V Vega“. 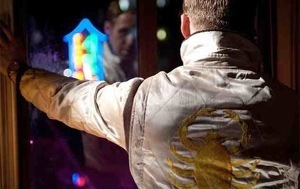 5: In Nicolas Winding Refn’s “Drive“, the driver references the fable of The Scorpion and The Frog: the frog agrees to carry the scorpion across the river; the scorpion stings the frog, saying “it’s my nature” and both drown. Driver can be seen as The Frog of the story – he drives/carries criminals (scorpions) around in his car, but is inevitably dragged into their destructive world (stung) leading to everybody’s downfall. Driver’s jacket has a scorpion on the back, just as the frog carried the scorpion on its back. 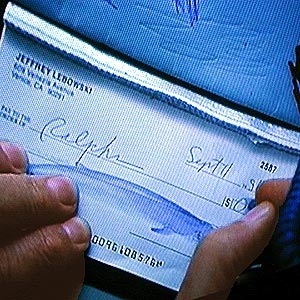 6: In “The Big Lebowski“, the $0.69 check The Dude writes at the beginning of the film is dated September 11, 1991, exactly ten years before the 9/11 attacks. While he is writing the check, George Bush can be heard on the television railing against Saddam Hussein. This film preceded 9/11 by 4 years. 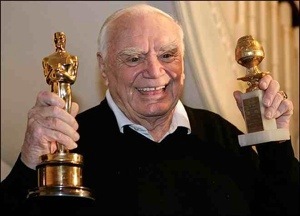 7: In 2007, Ernest Borgnine became the first male Oscar winner for Best Actor to still be alive on his 90th birthday, and in 2012, Ernest became the first male Oscar winner for Best Actor to still be alive (and working) on his 95th birthday. He recently died on 8th July this year. 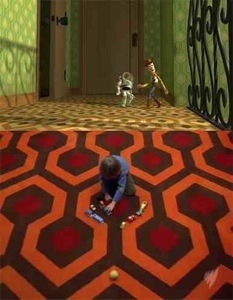 8: In “Toy Story“, the carpet designs in the evil kid Sid’s hallway is the same as the carpet designs in “The Shining“. 9: Keanu Reeves was originally signed to play Chris Shiherlis in “Heat” but he lost the part when Val Kilmer was able squeeze it into his schedule while making “Batman Forever“. 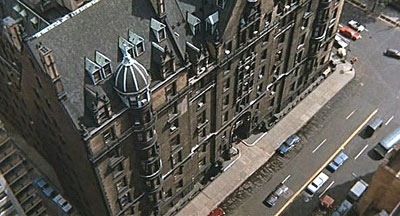 10: “Rosemary’s Baby” was released in 1968 and directed by Roman Polanski. Polanski’s pregnant wife, actress Sharon Tate, was murdered in 1969 by Charles Manson and his followers, who titled their death spree “Helter Skelter” after the 1968 song by The Beatles. One of that bands members, John Lennon, was murdered in 1980 outside the Manhattan apartment building where Rosemary’s Baby had been filmed. This entry was posted on September 3, 2012 at 2:11 pm and is filed under Uncategorized with tags 2012. You can follow any responses to this entry through the RSS 2.0 feed. You can leave a response, or trackback from your own site. Great list of trivia, that part about Rosemary’s baby adds even more to the creepy atmosphere of the film. Thanks Vinnie. I discussed the Rosemary’s Baby trivia with a few people over the last few months (yourself included I think?). Anyway, I thought I’d add it for those still unaware. It’s one of the better bits of info out there. Nice. You’re right Mark, this is going to be a good series. A great idea. Never knew the Toy Story carpet thing, that’s awesome. I’m a big fan of the Shining. Love the analysis on Drive, that’s really cool. Thank GOD Godfellas didnt wind up with Tom Cruise and Madonna. Can you imagine? God…. Thanks as always Fogs. I think this little feature will appeal to almost everyone. Surely somebody will always find something new to them. Yeah, the Toy Story carpet deal was new to me until recently as well and the fable on Drive makes a bit of sense. As for Cruise and Madonna, thats just wrong man. Liotta and Bracco owned those roles. The two of them were outstanding. Another excellent trivia piece, Mark. I’d only add about “the fable of The Scorpion and The Frog” that it was also used, different context though, in ‘The Crying Game’. Well done. Thanks Michael. It’s been a very long time since I seen The Crying Game but thanks for the info. I’ll be sure to keep that in mind when I see it again. Glad your enjoying the new feature my friend. Once again – GOOD STUFF out here!! Well done, amigo! Gracias Amigo. Much obliged as always. A nice mix of WOW, head-shaking, and creepy facts today Mark. Really good stuff. Awesome set of trivia Mark, I haven’t heard about a lot of these. WOW, look at all those actors that got cut by Malick, I’m surprised a lot of actors still want to work with him, ahah. I like Keanu but I think Val is a better choice for that role in HEAT. Cheers Ruth. Yeah, I think Rourke was the only one included in the deleted scenes section of the re-released DVD. The rest didnt get a look in and I’m sure there are actually more actors than that. As for HEAT, I’m not Kilmer’s biggest fan and despite his limited acting abilities, I’d liked to have seen Reeves in that role. He can certainly handle action movies. 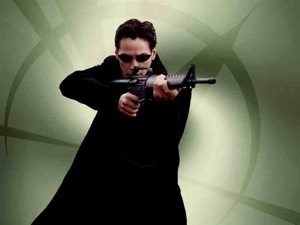 Yeah, I think I’d love to have seen what Reeves would’ve done with the role, too. I generally like Reeves more than Kilmer. I think a lot of people give him a lot of flak but he’s a better actor than the critics give him credit for. I agree. I thought he was particularly excellent in Sam Raimi’s “The Gift”. He plays an abusive redneck but does it really well. Id like to see him play more bad guys, I think he can do them. Even roles were his acting is questionable, he always has a certain appeal. He’s a bit of an enigma but I quite like him. WOW, I really need to see The Gift, that’s got Cate Blanchett also right? Can’t believe I haven’t seen it. Keanu as a red neck? Now THAT I gotta see! Yes, he’s definitely got a unique appeal, you’re right that he’s a bit of an enigma, but I’ve heard that he’s a generous guy and one of those rare Hollywood actors who don’t seem obsessed with making money or living a luxurious life. I respect him for that. The cast of “The Gift” is great. It’s a decent little gothic film that Billy Bob Thornton also wrote. It’s worth a look, if only to see Reeves play well. I too like the guys style. He comes across as just a plain old ‘dude’, for want of a better word. Despite what people say, he has to have some appeal – his film’s always do well and he’s probably the most successful “bad” actor I’ve ever came across. I was in New York in late December 1980 for a Christmas concert and mourners were still outside the Dakota. The Dakota is so expensive, it was rumored an early resident hid $30,000 in the floor somewhere but no one checked it out cause it cost more than that to remove the boards. The place gives me the creeps! I can’t imagine kids living there. It would be like living in a Halloween nightmare! It certainly is a freaky building. It’s really odd how that happened to John Lennon as well. Although saying that, he must have been aware of the Manson/Helter Skelter link when he lived there? With that link alone, if I were Lennon I’d have stayed well clear. Low and behold, he would become an even further part of it all. Never noticed that about Toy Story; that’s a fun catch. Double V Vega could have been fun. Yeah the Toy Story ones a nice little reference Morgan. I’ll never look at that the same way again. As for Double V Vega, that will always be one of the film’s I will forever wish went ahead. (unless he uses different actors, it might still happen) who knows? 2. 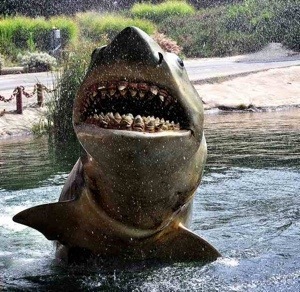 Steven Spielberg freely admits that Jaws was the worst time he ever had making a movie. Ironically, it sits alongside E.T. and Schindler’s List as his most acclaimed film to date, carrying a 100% grade on Rotten Tomatoes. Wonder if he loved filming Hook. 6. Wasn’t The Big Lebowski 1998? That’s a really neat fact though. 10. Oh my gosh, that’s a really bizarre one. Love it. In hindsight I your right Alexander. For some reason, I had Lebowski down as ’97. Either way, the fact still remains and it’s quite a strange one. P.S. : Is there something wrong with your phone? I’ve heard you say you blog via your smartphone, and recently, I’ve been noticing odd capitalization and whatnot on my blog as well as replying to comments on yours. Just something I noticed and found a bit odd. Yeah, i do all my blogging through my phone. I’m not aware of any faults though. Sometimes I’ll use capitals when I mention the name of a film but other than that, I tend not to. Keep me informed will you? I hope others are not seeing the same stuff. D’you know, it’s probably down to me typing fast and predicative text taking over. Sometimes I get very unusual words creeping in that were not intentional. “Tea Okra” being a prime example. 😉 Before I know it, I’ve sent the message and then realise it probably makes little sense. Sorry man. I do love these useful (less) bit of trivia Mark, i always learn a lot!! Haha. Glad to be of service Scott. You may notice that I omitted the word “useless” this week and changed it to “esoteric”. I took your opinion on board man. Thanks. Lovely stuff. Love the Toy Story fact; i became slightly obssessed by The Shining at one point so love seeing stuff like that. The Big Lebowski fact is also very weird, sure conspiracy theorists could have a ball with that one. Liking the feature so far Mark! Cheers Chris. Glad to hear it’s going down well. Conspiracy theorists would have a ball with the Lebowski one right enough. Very strange. I totally agree about Reeves messing up Dracula. He was very bad in that but I strangely find him appealing. Some film’s he absolutely dreadful though. I don’t really like Kilmer, so I wouldn’t have minded Reeves so much. It wasn’t a massive role and I think he tends to raise his game a little when playing alongside great actors. I thought he was pretty good in Devils Advocate. Cheers Andy. That story alone would make a good film. Thanks man. I thought you might appreciate the Drive info. Very interesting facts, Mark! I especially loved 3 and 5 through 8. Cheers Fernando. If at least one piece of trivia is new to someone, I’m a happy man. Another great batch of movie trivia, man! Tom Cruise in Goodfellas? Just can’t see it. I had heard about the Big Lebowski 9/11 reference before, but that’s just spooky. What a crazy coincidence. Cheers Eric. Yeah man, the cruiser in Goodfellas. I can’t quite picture it either but Madonna would have been even worse I think. Next time you see The Big Lebowski, have a look. It’s right at the beginning of the movie. Spooky indeed. Love these! Glad to see keanu keeps getting a mention! Thanks for stopping by Carly. So you’re a Keanu fan then? Not many people are. Strangely though, I’m quite critical of actors yet I find Reeves quite appealing. Aaaah! So you’re my good friends other half? It’s a pleasure. He’s never disclosed his dislike for Keanu to me but he loves DeNiro so I gotta have his back. On the Heat thing though, I’m not that big on Val Kilmer so I would liked to have seen Reeve give that a go. He can raise his game when he wants to. Have you seen the Sam Raimi film The Gift? He’s excellent in that and I firmly believe he should play more bad guys. Yeah that’s me! Not a big horror fan but have sat through a lot over the yrs with him! He does like point break but not because of Keanu and possibly devils advocate as pacinos in it lol. I have seen the gift but it was a long time ago. Need to see that again. I had high hopes for the watcher where he was a killer but it didn’t quiet deliver. I agree he does make a god bad guy although I’m a sucker for his rom coms. I wish he won’t sit through them! Glad to hear it! It’s always nice to find new followers. Hope you stop by often, you’re more than welcome here. Thank God Kilmer could do it! Yeah, I’m not kilmer’s biggest fan and I strangely find Reeves quite appealing but his wooden acting would have been out of its depth here.